It can be a rough and tumble world out there. * And in the case of public works construction in California, this includes bid disputes. 2-1.12C Subcontractor List. In the Subcontractor List, list each contractor to perform work in an amount in excess of 1/2 of 1 percent of the total bid or $10,000, whichever is greater (. . . § 4100 et seq.). The Subcontractor List must show the name, address, and work portions to be performed by each subcontractor listed. Show work portion by bid items number, description, and percentage of each bid item subcontracted. On the Subcontractor List you may either submit each subcontracted bid item number and corresponding percentage with your bid or fact these numbers and percentages to (916) 227-6282 within 24 hours after bid opening. Failure to do so results in a nonresponsive bid. CalTrans received a total of nine bids for the project. Security Paving Company, Inc. (“Security”) submitted the lowest apparent bid at $30,584,331, followed by DeSilva Gates Construction, L.P. (“DeSilva”) at $31,677,677, and Papich Construction Company, Inc. (“Papich”) at $32,611,185. DeSilva submitted an updated subcontractor list within 24 hours of bid opening, as it was permitted to do in the invitation for bids, identifying All Steel Fence (“All Steel”) as performing $15,023 worth of work. However, All Steel was not listed in DeSilva’s original bid. Papich’s bid failed to include an acknowledgment of the addendum. [Papich] failed to acknowledge Addendum #1 dated September 7, 2012, . . . on the signature page . . . of its bid proposal. [CalTrans] considers the addendum to be a material amendment to the contract and is unable to identify in Papich’s bid submittal that it considered and agreed to be bound to the terms of said addendum. A bidder’s failure to to acknowledge a material amendment to the contract renders its bid non responsive. Unless Papich is able to provide documentary evidence that it establishes it considered and agreed to be bound by the requirements of Addendum #1 its bid may be rejected. Since [DeSilva] originally decided to self perform Fences, Gates and Railing, but subcontracted those items to All Steel Fence, Inc. on the revised bid list received on September 14, 2012, CalTrans finds your bid is non responsive. CalTrans will proceed to award the contract to the lowest responsible bidder provided all requirements are met. DeSilva later filed a bid protest which was rejected by CalTrans. In response, DeSilva filed a petition for writ of mandate with the superior court requesting that the court invalidate CalTrans’ award of the project to Papich. The trial court agreed and Papich and CalTrans appealed. On appeal, the Court of Appeals addressed bid responsiveness. As discussed, determining whether a bid is responsive involves a two-step process: (1) whether a bid is responsive or not. Has the bidder submitted all of the correct bid forms, has it properly completed the bid forms, does the bidder have the required license classification set forth in the bid package, etc. ? If not, the bid is not responsive; and (2) if not, whether the variance in a bid is “material” or “immaterial.” If it is a “material” variance the public entity must reject the bid. If, however, there is merely an “immaterial” variance, the public may either waive the variance and accept the bid or reject the bid. Although DeSilva’s 24-hour subcontractor list was not exactly the same as its subcontractor list on the original bid, All Steel Fence was not slated to perform more than one-tenth of one percent of the total contract amount. Thus, the disclosure of All Steel Fence’s scope of work in DeSilva’s 24-hour subcontractor list constituted additional information that was accurate but unnecessary. The listing of All Steel Fence was not deceptive, indicated no shift of work from another subcontractor to All Steel Fence, and showed no attempt by DeSilva to flout the requirements of the information for bids. Notably, the information for bids did not prohibit the listing of subcontractors performing work amounting to less than the threshold disclosure amount of one-half of one percent. Because nothing prohibited the additional but unnecessary disclosure of subcontractors, DeSilva’s bid was not rendered non responsive by listing All Steel Fence on its 24-hour subcontractor list. The trial court did not err in concluding CalTrans abused its discretion in allowing one bidder to correct a mistake that the department had itself deemed a “material” deviation but rejecting another bid even though it did not materially depart from the information for bids or the Public Contract Code. The Court of Appeals also noted that Papich was provided an unfair advantage, because rather than withdrawing its bid and not forfeiting its bid bond, Papich was allowed by CalTrans to cure its nonresponsive bid. Be careful what you deem to be a “material” variance in your bid documents, and if you say something is going to constitute a “material” variance, stick by it. If you’re going to reject a bid, make sure you are rejecting the bid because the bidder has failed to comply with the invitation for bids or other legal requirements, not because the bidder has provided (as in this case) more than what is required under the invitation for bids or the law. 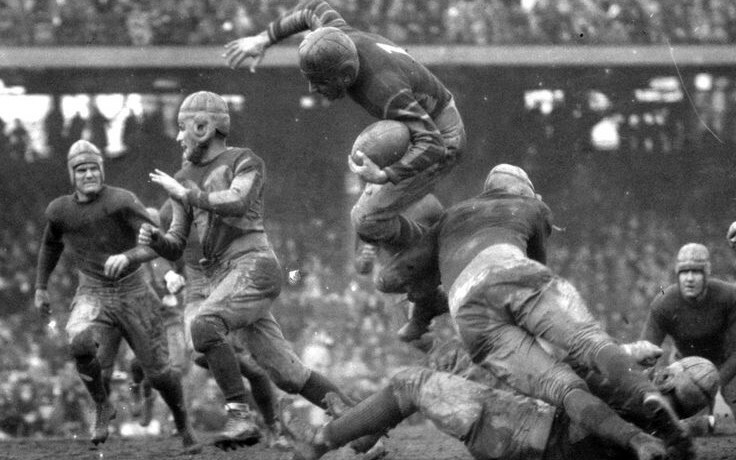 *For an interesting oral history of football in the United States take a listen to RadioLab’s podcast American Football which takes you back to the end of the 19th Century, to the hallowed halls of Harvard, Yale and Princeton, where a “lost” generation of young me take up a game called football. And a little known team, the most all American of them all, but with the most to prove . . . the Carlisle Indian School. Great blog. Who represented DeSilva, if you know? Thanks Roger. DeSilva was represented by Archer Norris and Smith & Brockhage.